An 'egg-stra' special celebration at Welsh Mountain Zoo Outdoor EventEaster has come early at the Welsh Mountain Zoo with the arrival of four tiny Emu chicks. Born at the Zoo at the end of February, the four birds, Sydney, Melbourne, Bondai and Byron, are all growing quickly with healthy weights ranging from 1.1kg to 1.6kg. The chicks are slowly becoming familiar with their enclosure and becoming more confident to roam around and to mark their arrival, the Zoo has chosen to kick start its Easter campaign early! With the three week celebration starting on 28th March, activities include the Easter Trail - a fun way to explore the Zoo where young visitors are given a task to find out facts and information about the zoo many animals, visiting enclosures and collecting the clues. All successful trail finders will be given a chocolate egg and automatically entered into a raffle to receive a giant sized chocolate egg. Other Easter adventures include ‘Guess how many eggs are in the nest’ which gives visitors a free guess at how many eggs are in our nest and the closest answer wins a bag of Welsh Mountain Zoo goodies. Art and crafts will be held each Tuesday and Thursday, as well as face painting throughout the week. Visitors also have the chance to take part in one of three enclosure encounters where lucky adults and children can get up close and personal with the Penguins, Meerkats or Snow Leopards (extra charges apply) Pre-booking is essential for an Animal Encounter. 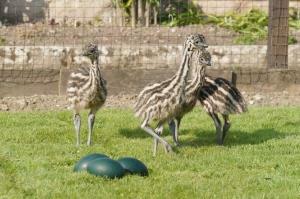 Easter has come early at the Welsh Mountain Zoo with the arrival of four tiny Emu chicks. Just 3 minutes drive from the A55 expressway - exit at Junction 20 at Rhos-on-Sea interchange - the zoo is signposted from here. From Bangor 20 mins, Caernarfon 30mins, Wrexham & Chester 50mins, Liverpool 60mins and Manchester 70mins.